John Borthwick, co-founder of Betaworks, parent company to bit.ly, twitterfeed, tweetdeck, chartbeat, and many other interesting web services, posted yesterday on "Ongoing tracking of the real time web …"
Through these various Betaworks companies, John and the team have access to a tremendous amount of data and if you are interested in this subject, you really should read John's post. I develop many of my theses based on what I see happening on this blog. And I've been seeing something on this blog that has gotten my attention. Traffic is way up to this blog in the first half of January. This blog has seen as many visits in the first half of January as a normal month. So I went to Google Analytics to find out why. And I didn't see anything particularly new and different in the first half of this month. 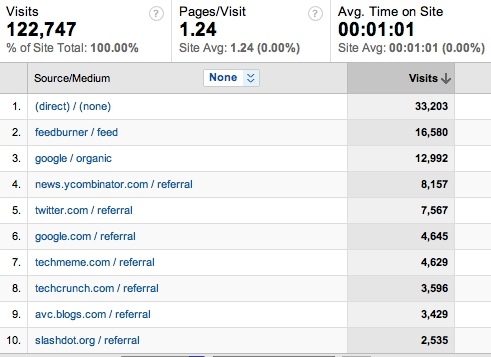 Now, where would google analytics be capturing those 35,147 clicks? Well Twitter.com for sure. But that's only 7,567. Could the other ~28,000 clicks be in the "direct" number? I am absolutely positive that a bunch of them are. But think about this for a second. 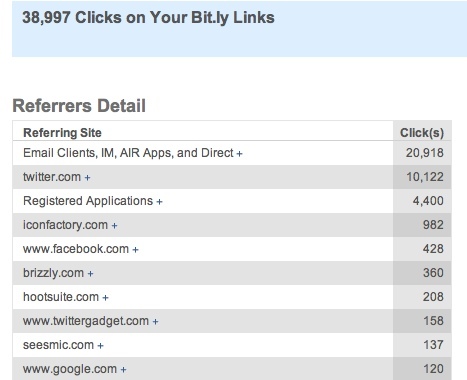 Of the 35,000 clicks I got from bit.ly in the first half of January, only 20% of them came from Twitter.com. So exactly how big is Twitter.com vs the Twitter ecoystem? John's chart estimates that Twitter.com is about 20mm uvs a month in the US (comScore has it at 60mm uvs worldwide) and the Twitter ecosystem at about 60mm uvs in the US. That says that across all web services, not just AVC, the Twitter ecosystem is about 3x Twitter.com. And on this blog, whose audience is certainly power users, that ratio is 5x. So the links I put out into Twitter in the past 30 days generated almost 39,000 clicks. Nice. But only 10,000 of those clicks happened on Twitter.com. The rest happened elsewhere in the Twitter ecosystem, including Facebook which is part of the Twitter ecosystem when they showcase a post that is generated on Twitter, as all of mine are. So that's a 4x ratio. That's a good double check. Whether its 3x (John's post), 4x (my links), or 5x (incoming traffic to AVC), it is clear that there's a big difference between the two. My point is this. You can talk about Twitter.com and then you can talk about the Twitter ecosystem. One is a web site. The other is a fundamental part of the Internet infrastructure. And the latter is 3-5x bigger than the former and that delta is likely to grow even larger.